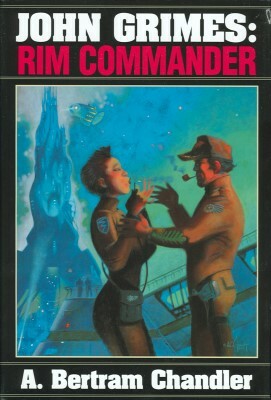 There's been a lot of talk recently about the “New Space Opera,” but, for my money, you can't beat the old space opera. I have to admit, though, that I haven't been reading Chandler for all that long: a member recommended this series about six years ago, so I took a look at it and was immediately hooked. Now we've come to the end of the series, with 23 novels (and 10 previously uncollected stories) combined into six neat, matching volumes. In this volume, we find John Grimes as an older man, working as the Astronautical Supervisor of Rim Runners (and Port Captain on the planet Lorn) after a long and very eventful life commanding various starships. But his skills are still needed, and Gateway to Never sends him (and his lovely and resourceful wife Sonya) back on active Rim Runner duty, sent off to foil a drug-smuggling ring on the planet Ultimo. There, Grimes finds an old enemy, and has a chance to finally even the score. Grimes is sent back out on one of the bizarre missions he specializes in. This time, he is to lead a crew to the Outsider ship, an enigmatic alien craft hanging outside the Galactic Rim. Everyone who's managed to get on board the Outsider has returned either dead or mad—but the Duchy of Waldegren is sending a ship out to try to extract its advanced technology for themselves, so the Rim Runners have to stop them. But out on the Rim, the border between reality and surreality blurs, and soon there's more than one Grimes—with even odder visitors to come from The Dark Dimensions.